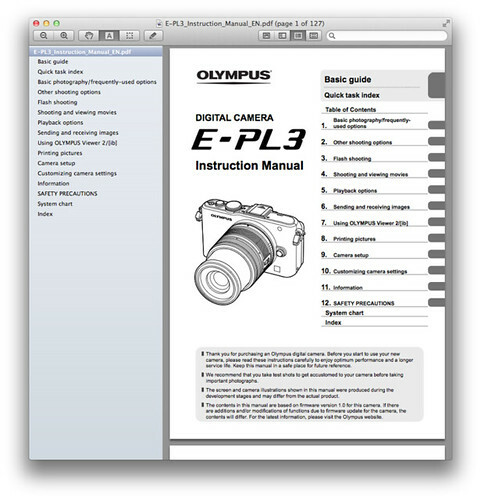 Olympus America hosts three versions of the Olympus E-PL3 user manual. Olympus E-PL3 Digital Camera Instruction Manual (English) – 3.8 MB, 127 pages. E-PL3 Manual de Instrucciones (Español / Spanish) – 4.0 MB. E-PL3 Manuel d’instructions (Français / French) – 3.9 MB. If the download links didn’t work for you, visit the official product manuals page for the E-PL3 to obtain the documents. You can also purchase the owner manuals there for $10 USD each. Olympus E-PL3 — Main page.